Above Photo: Susan Prevost, a New Orleans teacher, in a crawfish costume locked to a barrel during a protest against the Bayou Bridge pipeline in Iowa, Louisiana. By Julie Dermansky. On Thursday, April 5, opponents of the Bayou Bridge pipeline attempted to shut down its construction by blocking an industrial supply company’s facility in Iowa, Louisiana, just outside of Lake Charles on the same day a bill spelling out harsher penalties for pipeline protesters was advanced to committee during the Louisiana legislative session. 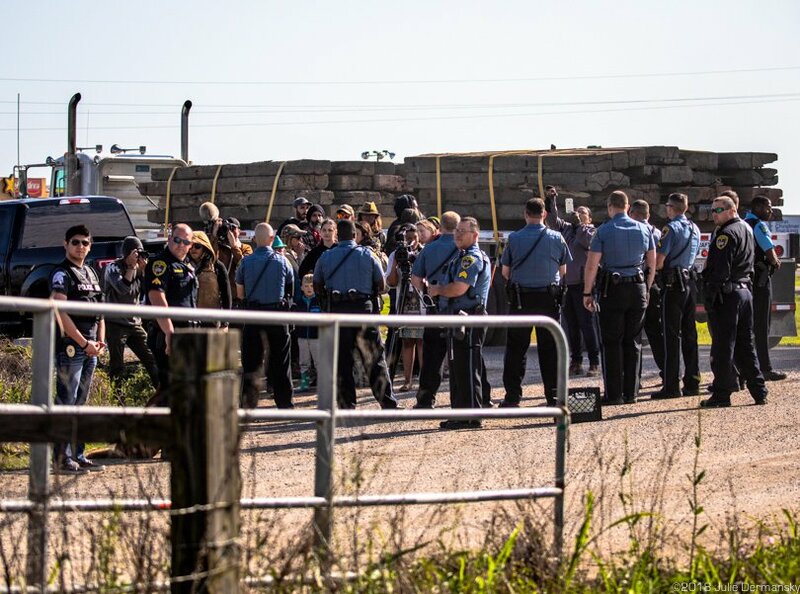 For about two hours starting at 6:30 a.m., roughly 20 protesters blocked the entrance to Yak Mat, an industrial yard that supplies access mats used to create temporary roadways at pipeline construction sites and enable trucks to pass through muddy areas. The site is close to the starting point of the Bayou Bridge pipeline, which spans south Louisiana from Lake Charles, near the Texas border, to St. James, along the Mississippi River. The pipeline is the tail end of Energy Transfer Partners’ Dakota Access pipeline network, which begins in North Dakota. 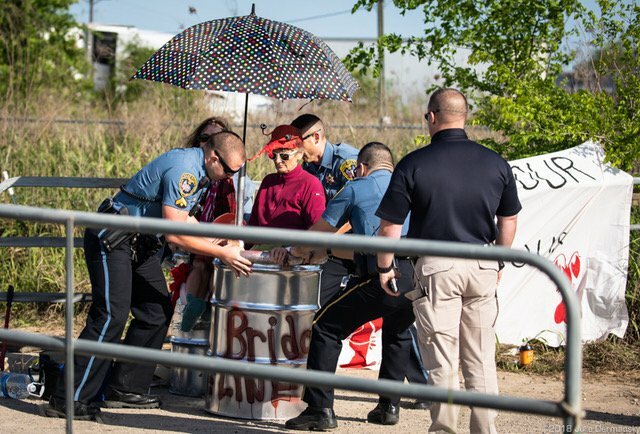 Renate Heurich, locked to a barrel, being rolled out of the entrance to the Yat Mat lot in Iowa, Louisiana, during a protest against the Bayou Bridge pipeline. Shortly after police arrived on Thursday, the protesters dispersed, except two New Orleans residents, both educators. Renate Heurich and Susan Prevost chained themselves into barrels fastened to the ground at the entrance to the mat supply yard. 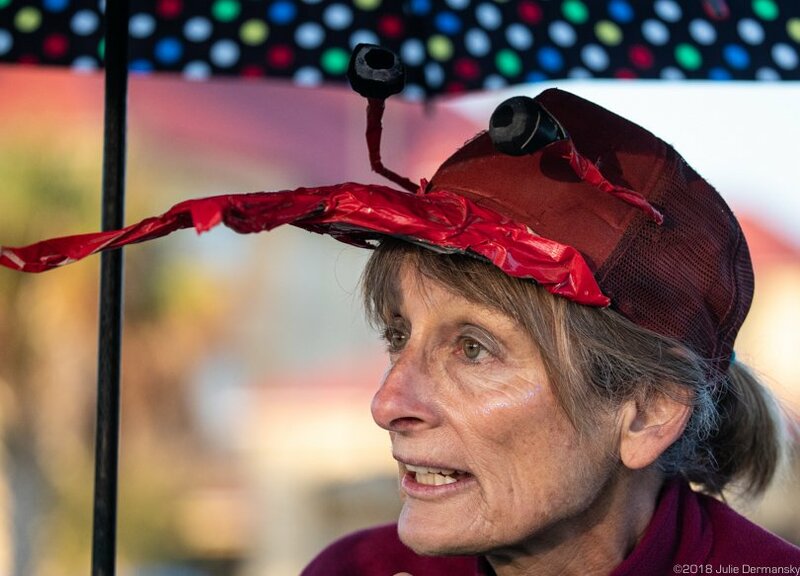 Both women started the day in crawfish costumes to emphasis the oil pipeline’s threat to the wild crawfish habitat in the Atchafalaya Basin, a National Heritage Area which the pipeline is being built through, despite an ongoing legal challenge. 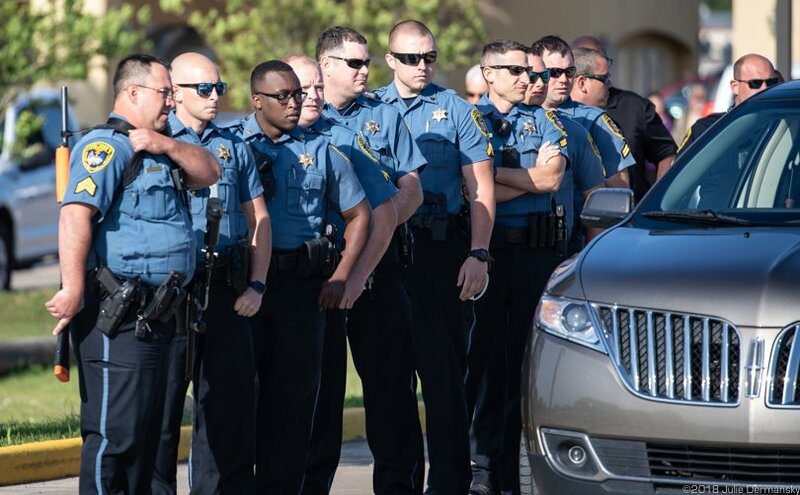 Law enforcement officers waiting to move in on the protesters in Iowa, Louisiana. There were more members of law enforcement at the protest than protesters. 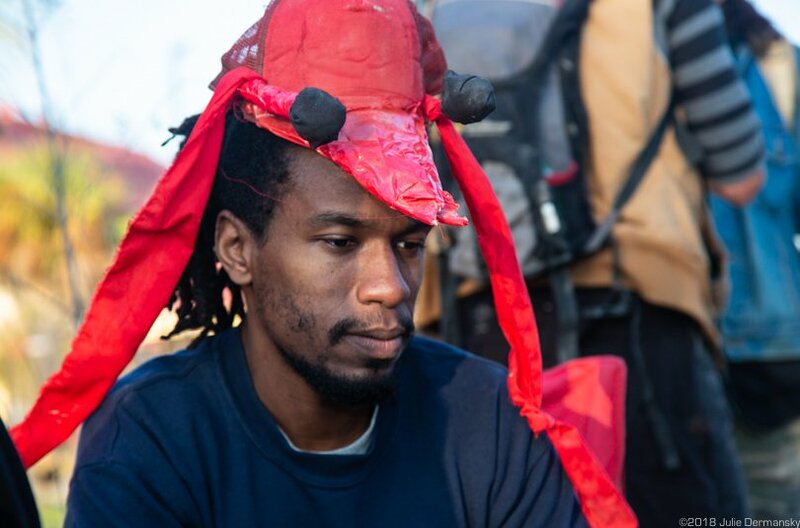 One of the Bayou Bridge pipeline protesters, dressed as an iconic Louisiana crawfish, in Iowa, Louisiana. Prevost stressed the importance of protecting Louisiana’s heritage. She worries that an oil spill in the basin will mean that future generations of local Louisianans won’t know the joys of traditional crawfish boils. A spill in the basin could decimate the wild crawfish population. “Can Louisiana really afford the Bayou Bridge pipeline from the company that has the worst record on pipeline accidents?” Prevost asked me the night before the protest. Heurich, a founding member of 350 New Orleans, believes it is imperative to take a stand against climate change. She believes direct actions against the pipeline are necessary because tremendous public outcry against the permitting of new fossil fuel projects and ongoing legal challenges against the pipeline have not succeeded in stopping its construction. 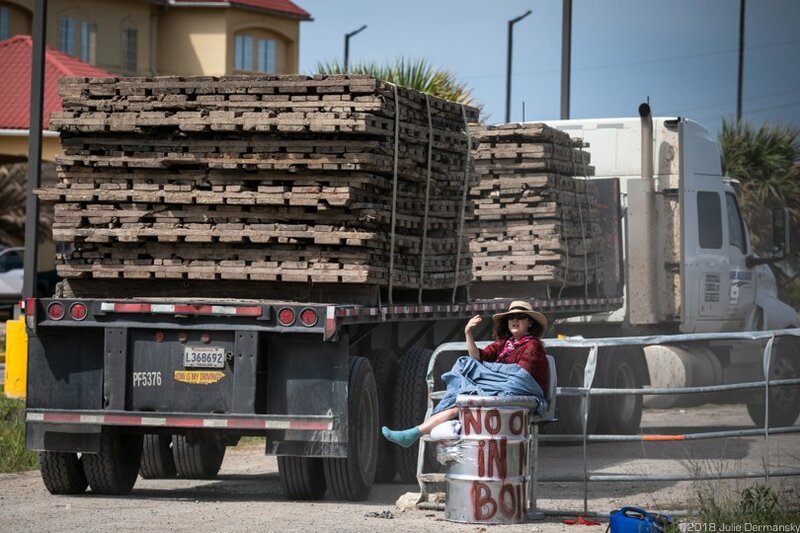 Renate Heurich, a retired teacher and member of 350 New Orleans, protesting against the Bayou Bridge pipeline in Iowa, Louisiana. Protesters move back when police move in and tell them to disperse. All but the two who remained in the barrels complied. Heurich also wants to protect Louisianans from the pollution oil and gas industry sites produce which sicken many people in fenceline communities, like St. James, a small town where the Bayou Bridge pipeline will end. She told me that people she knows are already dying of illnesses associated with toxic emissions from industrial sites in the area, including Keith Hunter, a retired carpenter, whom she met at an anti-pipeline meeting in St. James. Others she met a year ago in St. James have been diagnosed with cancer. After sheriff’s deputies managed to move Heurich’s barrel out of the way, operations were able to resume. 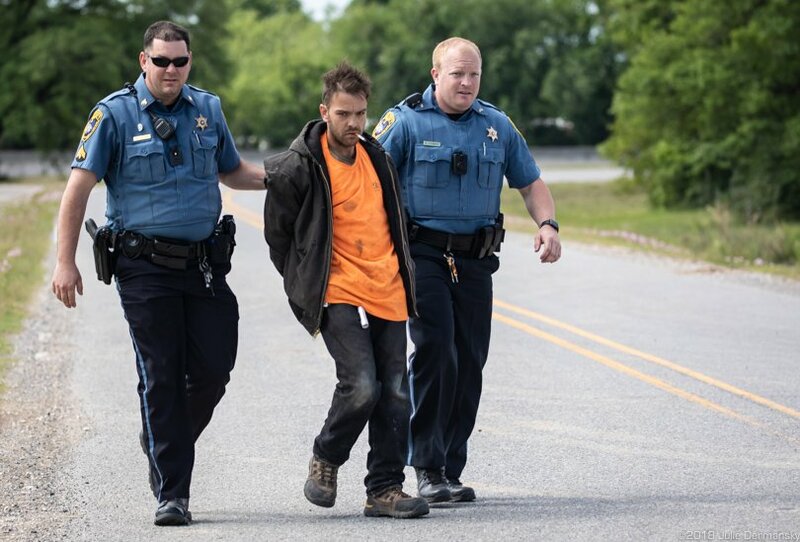 The deputies offered Heurich and Prevost a deal: If they unlocked themselves on their own, they would be charged with felony trespass, but avoid being taken to jail. Heurich unlocked herself, while Prevost remained in her barrel until noon, deciding to unlock herself after two trucks passed dangerously close to her. Truck loaded with mats returning to the yard passing dangerously close to Susan Prevost who was locked into a barrel fastened into the ground. After conferring with a lawyer, Susan Prevost removes herself from a barrel she attached herself to in order to block work on the Bayou Bridge pipeline. 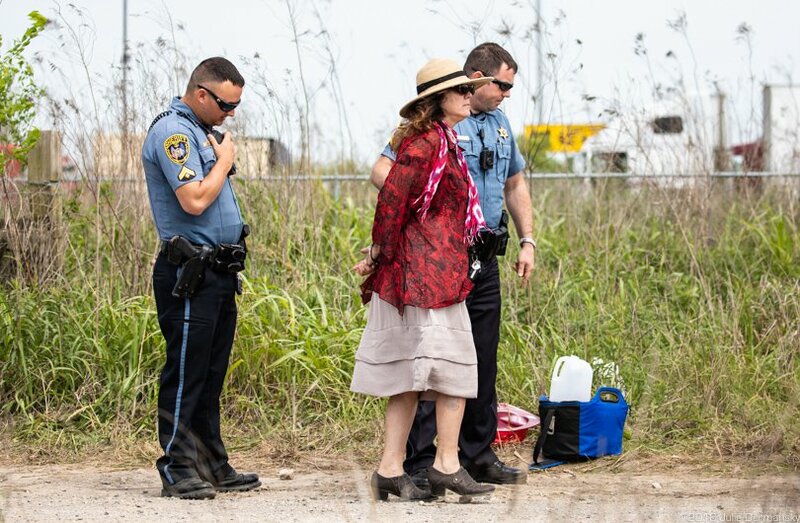 Susan Prevost being led away by police after her arrest during a protest against the Bayou Bridge pipeline. Cherri Foytlin, one of the founders of the anti-pipeline L’eau Est La Vie Camp (Water Is Life), was also arrested after live-streaming the demonstration for over an hour at the end of the driveway, which she thought was a public road. “I complied with what the officers told me,” she wrote in an email. When the police came after her, others from the camp pleaded with the officers to let her go, explaining she hadn’t heard them tell her to get off the driveway. Another activist who took part in the protest was accused of stealing a car. All were released later the same afternoon but face charges. 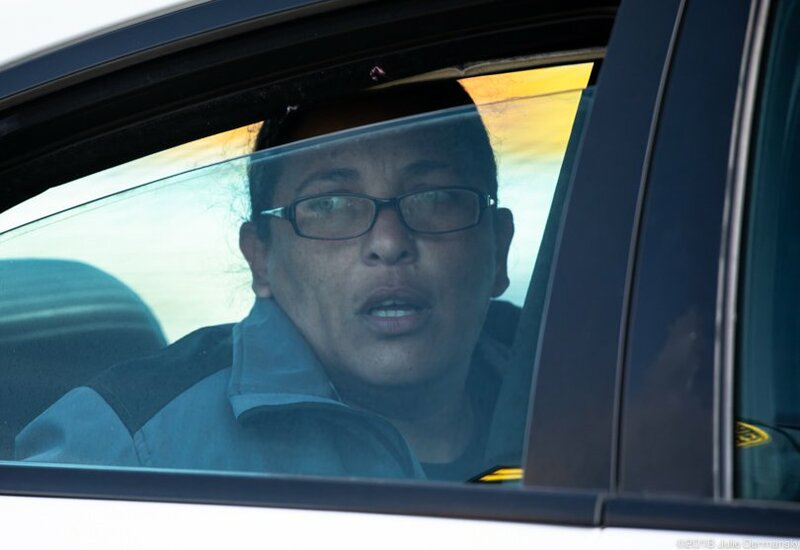 Cherri Foytlin, in the back of a police car being taken to jail for trespassing during a protest against the Bayou Bridge pipeline. Louisiana law already prohibits trespassing at sites known as “critical infrastructure,” including power plants, oil refineries, chemical plants, water treatment facilities, and natural gas terminals. House Bill 727 adds pipelines and their construction areas to the list of critical infrastructure sites, a move in reaction to growing pipeline protests nationwide. The bill increases the penalties for any damage to or interference with pipeline and other critical infrastructure sites. 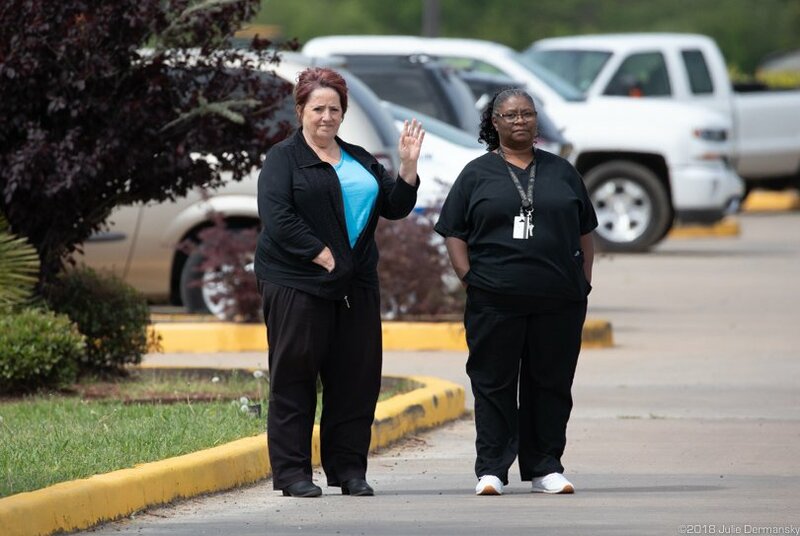 Sentences range from one to 15 years in prison with a $10,000 fine or six to 20 years plus a $25,000 fine if the damage could threaten human life or disrupt site operations. In addition, this state bill criminalizes “conspiracy to commit trespass.” Anyone involved with organizing a protest like the one on April 5 could face a year in prison. And anyone connected to an action that involves damaging the infrastructure could end up with a prison sentence of 20 years and fines of up to $250,000 if a judge rules that they are part of a conspiracy that threatens life or the operation of critical infrastructure. “The language concerning conspiracy is worrisome,” Spees told me during the protest in Iowa. “The conspiracy provision makes it possible for law enforcement to arrest people before they have actually done anything wrong, even if they are just planning a nonviolent protest.” After Thursday’s protest, Spees traveled to the jail to help make sure everyone arrested during the demonstration was released. Along with a handful of others, Meg Louge, a member of 350 New Orleans, spoke out against HB 727 at the state capitol in Baton Rouge. Many of them objected to the proposed law because existing trespass laws are already in place. Some argued during Thursday’s legislative session that the new law is meant to quash dissent against oil and gas pipelines. “The representatives who spoke in favor of the bill cited the protests in North Dakota a couple of times and how they don’t want Louisiana to ever have a ‘Standing Rock’ type situation,” Louge said. Though Louge was not pleased the bill was moved to committee, she said that she was glad that Rep. Valarie Hodges, one of the bill’s sponsors, agreed to amend the conspiracy language during the session, before the bill is voted on in committee. Manager of a LaQuinta Hotel next to the industrial yard waving goodbye as the protesters left the area. Some of the hotel’s workers were taken aback by the protesters who interfered with some of their guests’ work. Many workers that use the mats stay in the hotel. 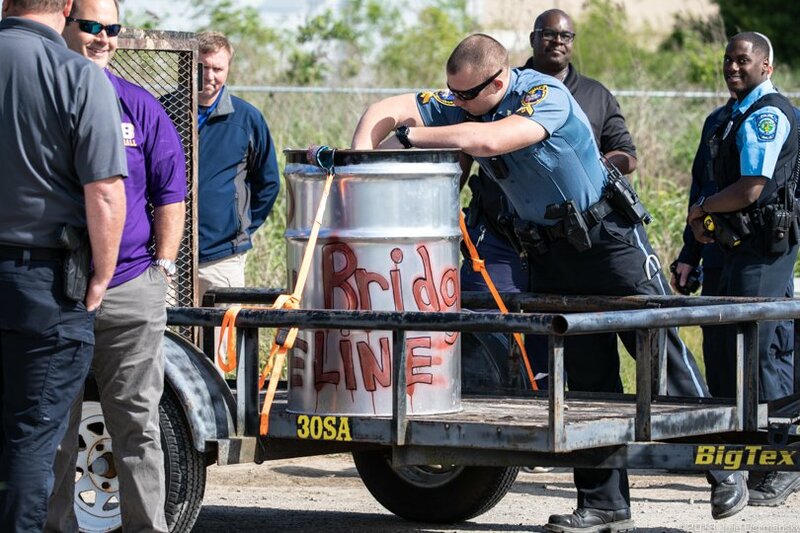 Law enforcement removing one of the barrels used in a protest against the Bayou Bridge pipeline in Iowa, Louisiana. Thanks to those on the front lines!! All of the politicians who are in thrall to the oil industry must be opposed for election or re-election. The worst are Republicans from Florida to Maine to LA to Alaska. Vote them out. Reject the people who are destroying our environment, our health and our potential for millions of jobs in clean energy. Vote for Democrats at every level and hold them to account for their actions if they fall into the morass of oil industry pollution and money.